The high cost of quality patio furniture makes every penny spent on cleaning and maintaining it well worth the investment. 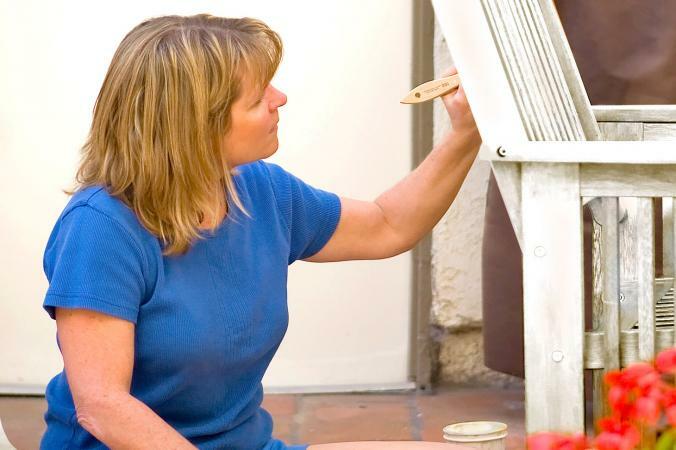 Touch ups of scratches, nicks and scrapes on painted frames not only improve the appearance of patio furniture, they can help prolong the durability of the frame and finish. Before you start your touch up project, you'll need to remove cushions, clean the furniture, and check for damage. Whenever possible, completely remove upholstered seats and cushions before attempting to touch up or repaint patio furniture. 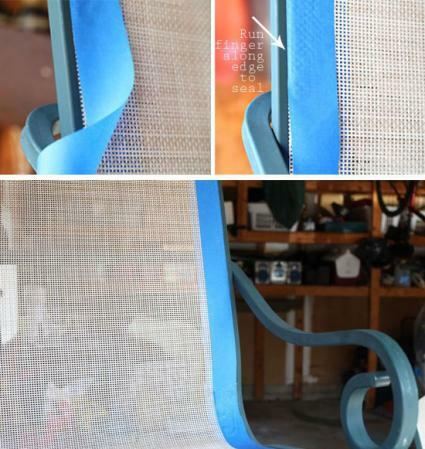 In the case of hard to remove sling-style seats on chairs, use painter's tape to carefully tape off all the edges where the material meets the chair's frame. Run your fingertip along the edge to ensure a tight seal. Then use newspaper and tape to finish covering the areas you don't want painted. Use this method to protect glass tabletops as well. All surfaces needing touch-ups or repainting must be thoroughly cleaned first. Methods vary by the construction and material of the furniture's frame. Cleaning can also reveal nicks and scratches hidden by dirt or unwanted mold and mildew. A few nicks and scratches on a single frame will hardly be noticeable, if at all, once they are touched up. However, if the color has faded, the paint is peeling badly or there are large areas of wear, it's better to just repaint instead of trying to camouflage dozens of touch ups. Be sure to buy an extra can of paint so you will have an exact match for future touch ups. Natural wicker furniture should only be used on covered porches or patios because the sun will quickly dry out and deteriorate the fibers, causing them to crack or split. It's important to clean wicker gently, so you don't compromise the integrity of the woven material. Prepare your work space in a well ventilated area such as an open garage or backyard patio. Place the wicker piece on a drop cloth to catch cleaning solutions, sanding debris and paint. Use additional drop cloths if needed to protect any nearby walls or objects. Using the duster brush attachment on the vacuum hose, go over the entire surface of the wicker furniture to remove any loose debris, dust or cobwebs. Remove any flaking or peeling paint with a stiff wire brush or sandpaper taking care not to damage the woven material. If the furniture has a glossy lacquer or varnish finish, apply the liquid sander, following the package instructions. Go over the entire surface again using the sponge and soapy water to remove any grease or oily deposits on the wicker surface. If you come across any mildew, apply the bleach solution to the affected areas with a sponge. Rinse the bleach by spraying the area with clean water. Allow the furniture to air dry completely. Depending on how severe the scratches appear, you'll need to choose one of two methods for touching up your furniture. Spray a small amount of primer into a plastic bowl. Use the small paintbrush to fill in or cover any exposed areas of rattan, rush, or cane. Once the first coat is dry, apply a second coat and allow it to dry. Repeat with the spray paint, using the paintbrush to apply thin coats until the color is blended in. Hold the piece of cardboard in a position where it will catch the paint over-spray (the spaces under or behind the area you're spraying) and apply a thin coat of primer over the exposed area, keeping the can 8 to 10 inches away from the surface. Apply a second thin coat after the first one is dry. Repeat with the spray paint, applying thin coats until the color and coverage is consistent with the rest of the furniture. Good quality resin wicker is designed to stand up to outdoor elements and doesn't readily fade in the sun, as the material contains built-in UV inhibitors. However, after many years of outdoor use, even resin wicker can start to look a little dingy and some homeowners opt to paint it to suit their decorating style. Vacuuming is also a good way to remove dust, loose debris and cobwebs from resin wicker. However, wipe down resin wicker with an ammonia-based cleanser or if the plastic is fairly new, use paint thinner for the best results. Use the same two methods described for natural wicker to touch up the paint on resin wicker except for applying the primer. Primer is not necessary; just be sure to use the exact same paint used to refinish the furniture. Krylon Fusion is the paint to go with on any type of outdoor resin or plastic furniture, as it can bond to plastic and is recommended for wicker furniture. You can also eliminate the need for primer on natural wicker by using paint with primer included such as Krylon ColorMaster Paint + Primer. Wrought iron outdoor furniture is especially susceptible to rust, so it's important to remove any existing rust and to use a type of outdoor paint that can help prevent it in the future. Place drop cloths underneath furniture to catch cleaning solutions, flaking rust and paint. Mix equal parts vinegar and water. Use a rag and a scrub brush to clean the metal of any dirt or grime. Wearing a dust mask and safety goggles, use a stiff wire brush to remove all areas of rust and flaking paint near scratches or scrapes. Scraping the surface also helps rough it up for better paint adhesion. For heavy or hard to remove rust, apply the naval jelly following the package instructions. Do a final wipe down of the furniture with clean rinse water to remove any residue or loose debris. Use the brush that came with the touch up paint to fill in and cover exposed metal. Apply thin coats to build up and blend the color. If using spray paint, spray a small amount of paint onto a disposable plate. Use a small paintbrush to apply the paint, adding thin coats until the desired coverage is achieved. Hold the cardboard piece under or behind the area you are about to spray to catch the overspray. Spray a thin coat of paint on the exposed area, holding the can 8 to 10 inches away. Wait for that coat to dry before applying the next coat. Stop when the coverage looks even. Rust-oleum's Stop Rust Touch-Up Paint has a small brush conveniently installed in the cap. The downside is that it only comes in black or white. For other colors, consider Rust-Oleum's Universal Paint and Primer in One. Not only does it eliminate the need for a primer, it has built-in rust inhibitors to protect metal and comes in numerous colors and finishes. The frames of cast aluminum patio furniture are not likely to rust. However, exposed areas from chips or scratches in the paint are susceptible to oxidation which can make it difficult for paint to adhere in the future. Cast aluminum furniture often has a rock-hard, powder coat finish that many manufacturers provide touch up paint for. Although a powder coat finish can be touched up with acrylic enamel spray paint, the touched up areas will not be as durable as the surrounding powder coat. Never use abrasive cleansers or products with bleach on cast aluminum furniture as they can damage the finish. Test cleaning solutions on an inconspicuous part of the frame to check for any discoloration. Protect your work area by placing drop cloths under the furniture. Mix a small amount of mild liquid soap with warm water and wipe down the furniture frame to remove any dirt, grime and greasy residue. If you come across calcium build-up, mix one part vinegar to nine parts water to remove it. Rinse with clean water and dry with a towel. Lightly sand the edges around scratches, nicks or chips in the paint. Sand as little an area as possible to avoid making the scratch or nick larger. Dampen the lint free cloth with rubbing alcohol and wipe away any residue. 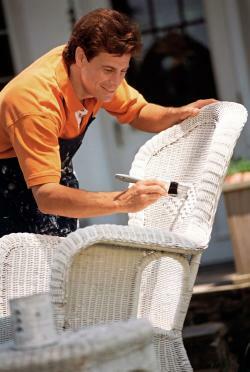 Check with the manufacturer of your cast aluminum furniture to see if they offer touch up paint. Companies such as Cast Classics, Homecrest Outdoor Living and Tropitone direct you to order the paint through a local authorized dealer. Spray a small amount of touch up paint into a disposable bowl. Use the small paintbrush to apply the paint in thin coats until the desired coverage is achieved. If the finish is textured, wait for the last coat of paint to become tacky and dab the surface with a clean dry paintbrush. Hold the spray paint can about 4 to 6 inches away from the scratch and spray one light coat, keeping your arm in motion to avoid excessive build-up. Use your other hand to hold the cardboard behind the area you're spraying to catch any overspray. Wait 10 minutes or when the paint is dry to the touch, go back over with another spray, continuing to add thin coats until the scratch disappears. To enhance a slight texture, wait 3 to 5 minutes for the last coat to become tacky and then pat with a damp, lint free cloth. Caution: Tropitone warns against attempting to get full coverage with the first coat of paint. Solvents in the spray paint may cause the surrounding finish to loosen and wrinkle if one heavy coat is applied. Restoration Hardware offers outdoor furniture touch up kits designed to match their painted aluminum finish. Instead of spray paint, the kit includes a marker, sponge and scraper, similar to what you would find for touching up indoor wood furniture. Touch up paint for Hanamint Aluminum Outdoor Furniture can be purchased online as well. Note: Some multicolor finishes require a two or three paint color coat process. If you don't know the manufacturer of your cast aluminum furniture, Orbit Industries makes touch up paint and pens for powder coat paint finishes. Rust-Oleum's Universal Hammered and Forged Hammered Spray Paint contain a built-in primer and mimic the look of a textured Hammertone powder coat finish. Wood patio furniture requires the most maintenance and care to keep the furniture looking and performing at its best. Protective coatings such as paint, sealed stains and spar varnishes with UV blockers help protect wood from the drying and bleaching effects of the sun and the mildew and rot caused by excessive moisture. Instead of just touching up scratches, nicks and areas of wear, it's usually better to repaint the entire surface of wood furniture - the more you encapsulate wood with a protective coating, the longer it will last outdoors. According to Today's Homeowner, wood furniture should be recoated every year or two. When cleaning wood furniture, it's important to check everywhere for signs of mold or mildew, so be sure to turn the furniture over and check underneath it. Choose a well ventilated area that is also protected from the wind so dirt and debris doesn't stick to the paint when it's drying. Place drop cloths under the furniture to catch cleaning and sanding debris as well as paint. Mix about ¼ cup dishwashing soap with a gallon of warm water. Use a cleaning rag to remove dirt, grime and any oily residue from the surface of the furniture. If any mold or mildew is present, apply the bleach solution and allow it to sit for a few minutes. Rinse the furniture with clean water and allow it to dry completely. If the previous finish is still in good condition, roughen the surface using coarse grit sandpaper, going with the grain of the wood. For cracked and badly peeling paint, use an orbital sander to remove the finish down to the bare wood. You'll find a lot of good paint options for outdoor wood furniture, depending on how you want to apply it. If you're painting over a previous finish that is still mostly intact, you can skip the primer but exposed wood spots can cause an uneven finish. Cover the furniture with a stain blocking primer. Apply primer and paint to every inch of the surface, including underneath to seal the wood completely. Oil-based exterior grade paint provides excellent durability on outdoor furniture but you can also use latex paint over a stain blocking primer. Most spray paint is oil-based and provides easy application on chair legs and benches with multiple wooden slats. Shake the spray primer for about a minute to mix the contents well. Hold the can about 10 to 16 inches away from the surface and spray in a steady back-and-forth motion, slightly overlapping each stroke. Apply a second coat of primer after the first coat is dry to the touch. Allow the primer to dry for 24 hours. Apply the spray paint just as you did with the primer. Shake the can for a minute to mix the paint and hold the can about 10 to 16 inches away from the surface. Spray a thin coat of paint using a steady back-and-forth motion, slightly overlapping each stroke. Apply the second coat within 1 hour or wait for 24 hours. If you can't reach all surfaces without turning the furniture over, wait at least 24 hours and carefully reposition the piece to repeat the process on the other side. You'll find plenty of color options with Valspar's Project Perfect Paint + Primer and Valspar Outdoor Enamel Spray Paint. Both formulas are fade resistant, suited for wood and outdoor use, and contain a built-in primer. Although spray paint tends to dry faster than brush on paint, drying time will vary by the brand and formula of paint you're using, the material being covered and the temperature and humidity of the surrounding air. Be sure to read the manufacturer's instructions for the wait time between coats or when the paint should be dry to the touch. If you want the best results for your touch ups or repainted surfaces, allow the paint to fully cure before using the furniture. Oil based paint takes 3 to 7 days to cure, meaning it is as dry and hard as it will ever get. Paint that is only dry to the touch can easily be dented or scratched off.